The small wooden boat was moored in a little inlet nestled next to the Iconic Pavilion and close to a fueling dock in Newport Harbor. Other boats and dinghies also called this place home and were peacefully floating in the water on this early Saturday morning. A slight fog rolled gently across the bay and you could hear the fog horns in the distance. Under the watchful eye of a small girl, a gray haired fisherman was pulling the bright yellow vessel to shore to attach the outboard motor and to fill it with all of his fishing gear. The child was anxiously waiting for her turn to get lifted in the boat to begin a full day of trolling around the bay in search for the best fishing spot. With an undersized spinning reel and rod in hand, she knew it wasn’t just about the fishing; for her, it was being with her Dad and spending the day in the harbor. That little girl was me and so started my love for the wonderful world of the Newport Harbor. I love this place and even more so during the holidays. Thanks for bearing with me on my trip down memory lane because I can’t help myself. 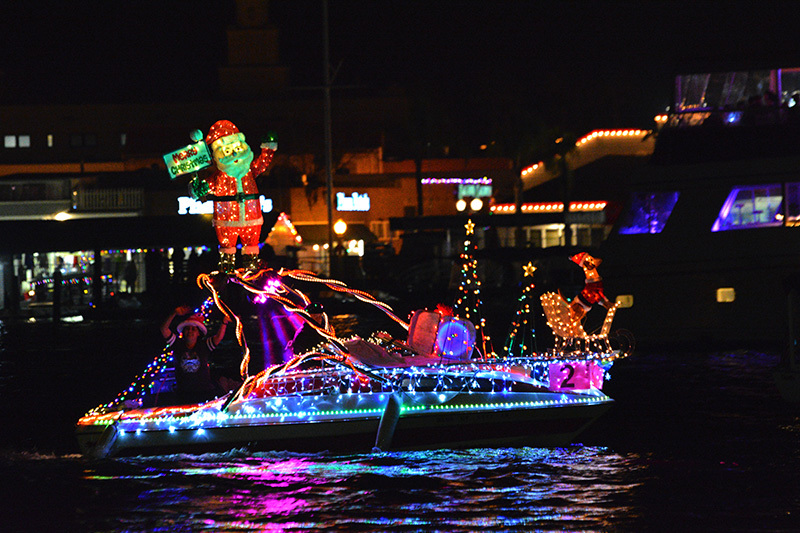 Every time I go to the holiday boat parade I think of the many times the little yellow craft motored around the bay in search of the catch of the day. 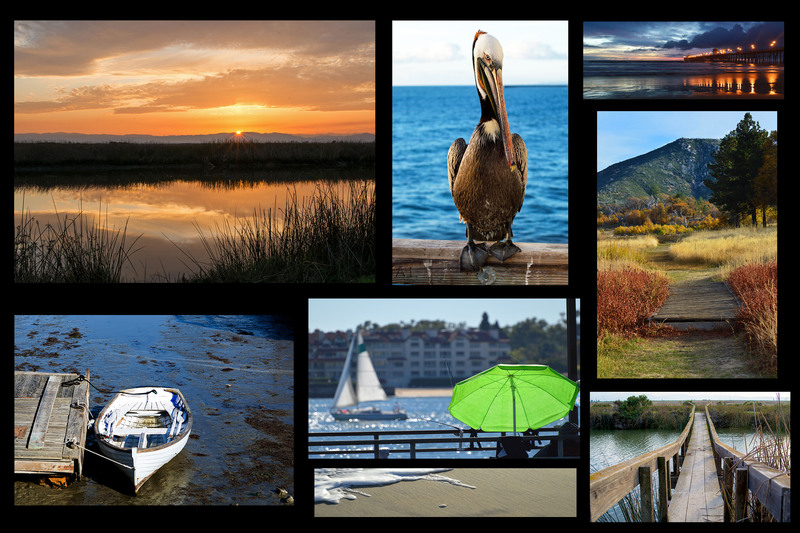 Exploring deeper in the harbor you will find channels, small canals, islands, and some of the nicest bay front homes in California. 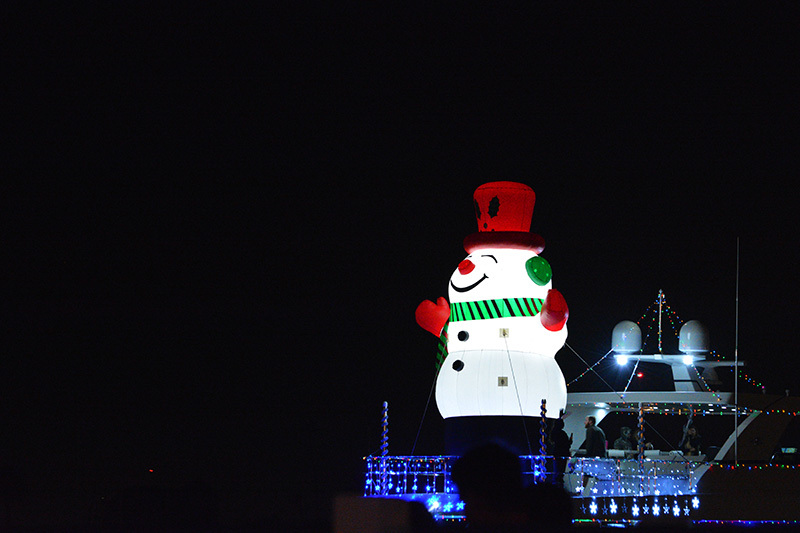 During the holiday season, many of the homes deck out in holiday décor and tons of lights. 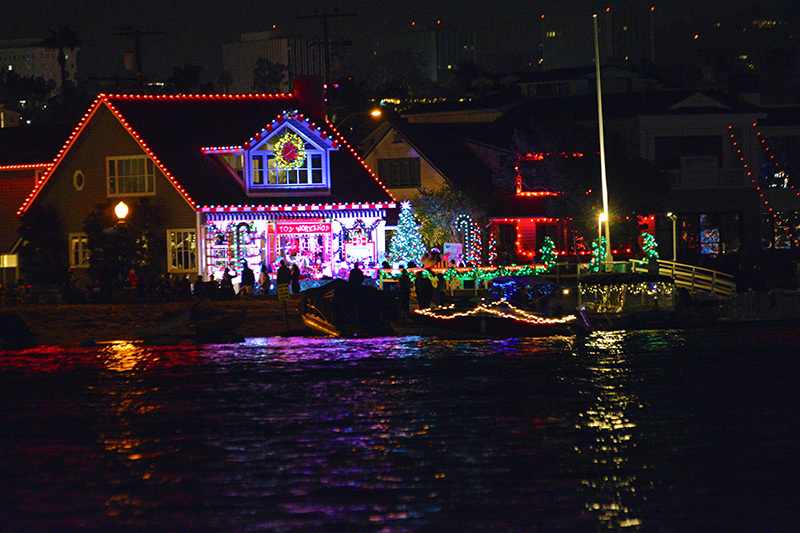 Along with the annual boat parade, some of the homes compete in the annual, “Ring of Lights” contest where awards are given in various categories. Last year we rented a duffy to see the home fronts, this year we came to watch the parade. The parade this year ran early from the 13th to the 17th. So the next time you will see it is in 2018. All I can say is put it on your calendar because it is a good one. 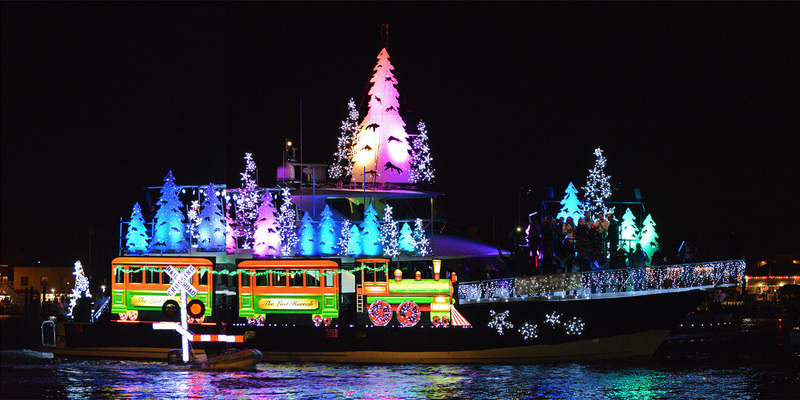 This is one of the most premier boat parades in California. 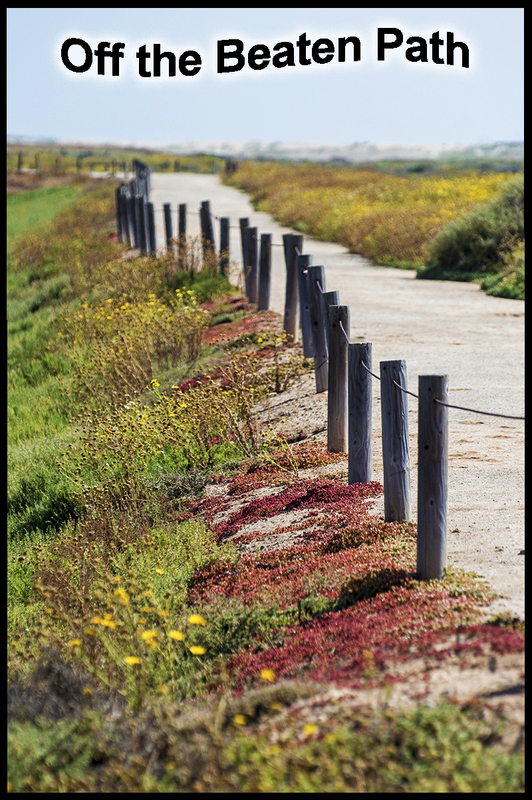 The week prior we went to the Oceanside Harbor parade and it was fun and festive. However, the size of the boats that were featured in this parade would be hard pressed to even turn around in that smaller harbor. 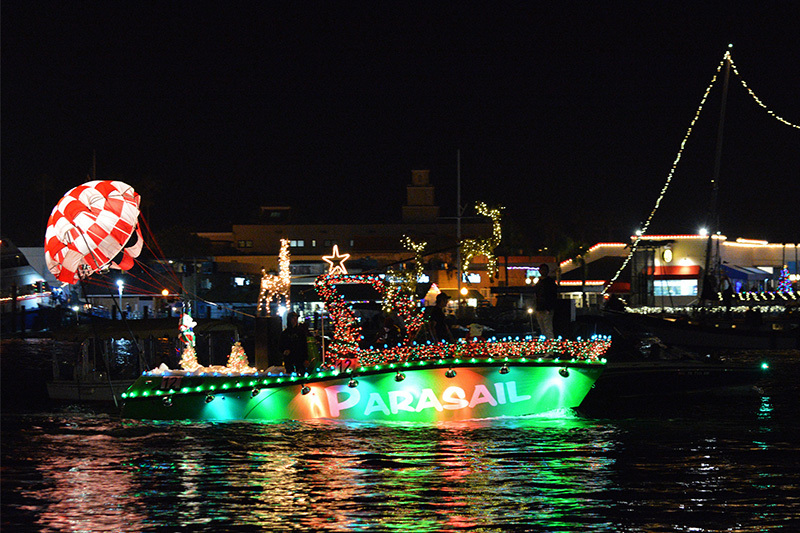 Even the party boats that cruised back and forth along the parade route in Newport were huge. At parade time the harbor is filled with life and activity everywhere. Some boats decorate even if they’re not in the parade. The start of the parade always starts with the harbor patrol or coast guard and this year was no exception. 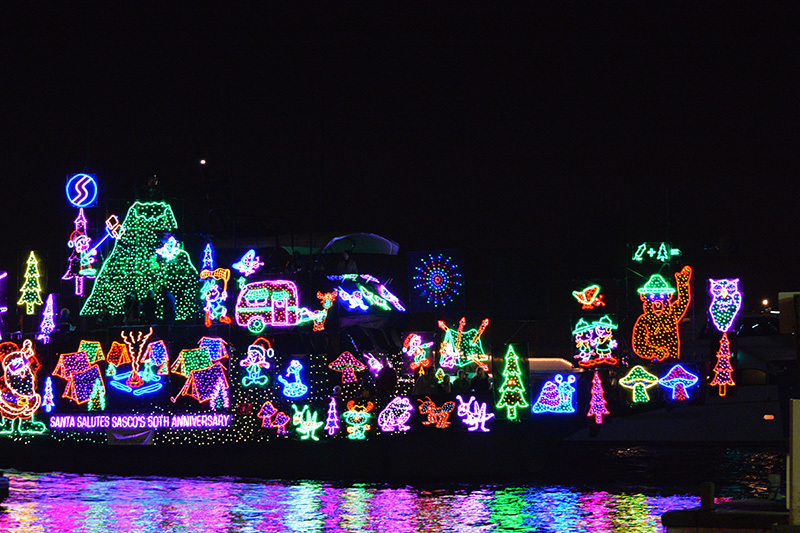 The boats cruised by and some were just plain spectacular with light shows, blow ups, and elaborate decorations. A couple of them were so large that they barely fit in the view finder of my camera. 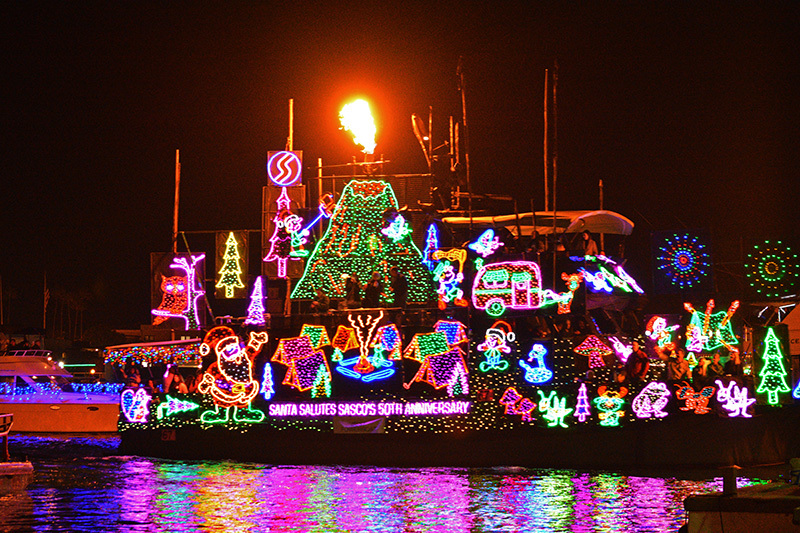 There was a volcano that spewed real fire; there was a large train, a band playing, all sorts of large blow ups, Santas, a live nativity scene, and even some of the smaller boats had creative embellishments. The Best Place to see the Show! 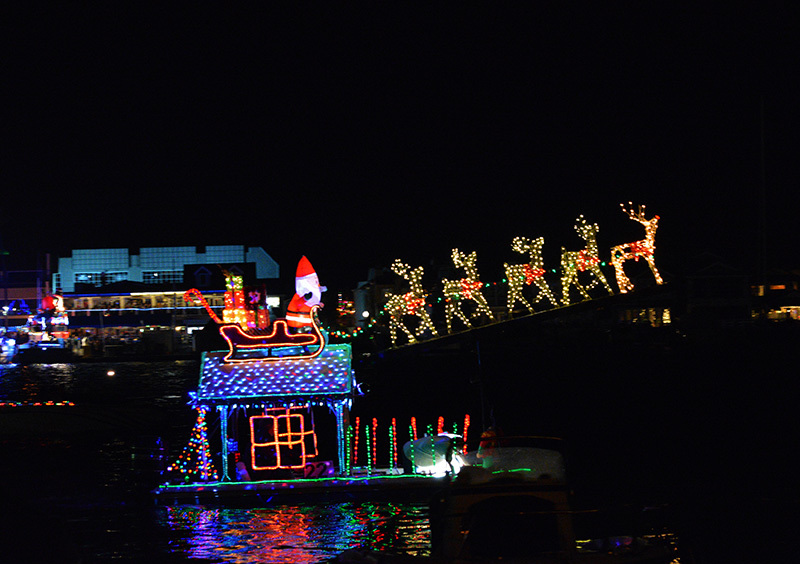 It was a good show from our seat on the sea wall on Balboa Island. The short ferry boat ride took us to the island from the Fun Zone and Pavilion area on the Newport Peninsula. 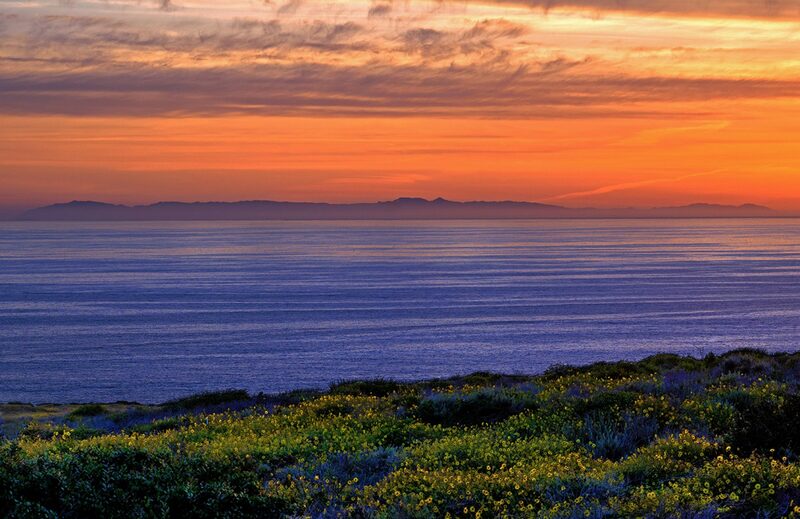 On the Balboa side or Newport side, this is the place to be. 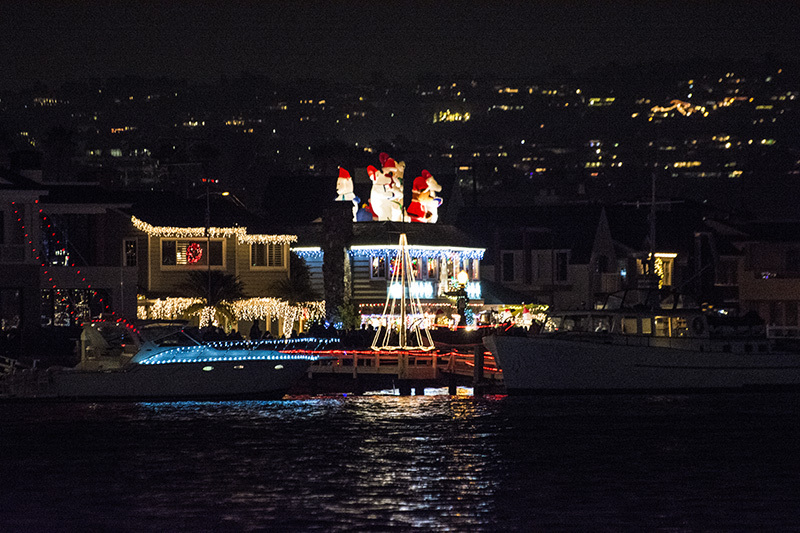 The homes on the bay and on surrounding streets decorate to the nines. Beverage stands with hot chocolate or coffee provide drinks for the crowd and the atmosphere is festive. It isn’t all just about the boat parade. The homes dress up too! I am glad that it makes me as happy today as it did as a tiny blond haired fishing girl. It is a magical place that gets you in the mood for the holidays. One lady I spoke with has been decorating her house for years; her friend said she displays over 4,000 bears of every size in her impressive display. That is the spirit that shows up every year and I hope for years to come. I may not go every time but I know it is always there if I want. The old wooden fishing boat is long gone but there are others in its place. It hasn’t changed much in that quaint little area. Either has the harbor and I hope it never does. 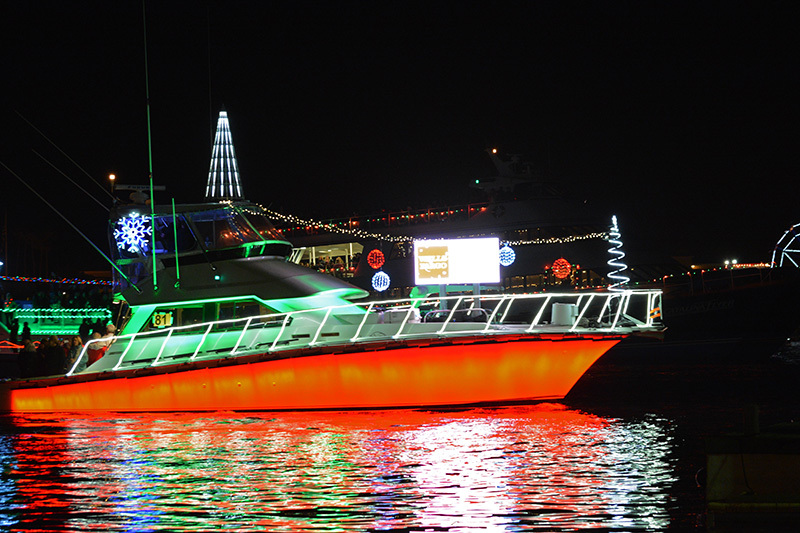 Be sure if only once in your lifetime to see the Newport Boat Parade. 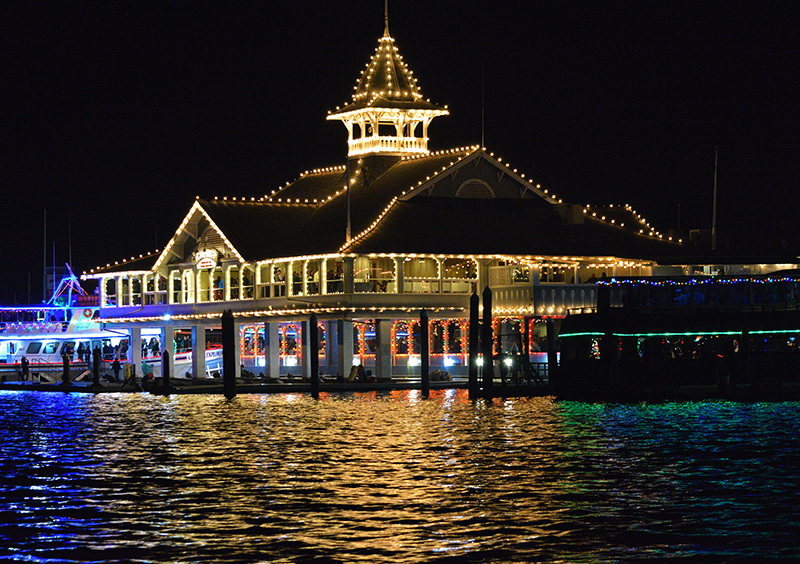 Take the ferry over to the bay front of Balboa Island and stroll along the homes. Have some hot chocolate and sit back and enjoy the scene, hopefully this will put you in the festive spirit.